Welcome by again today, sweet blog friends! 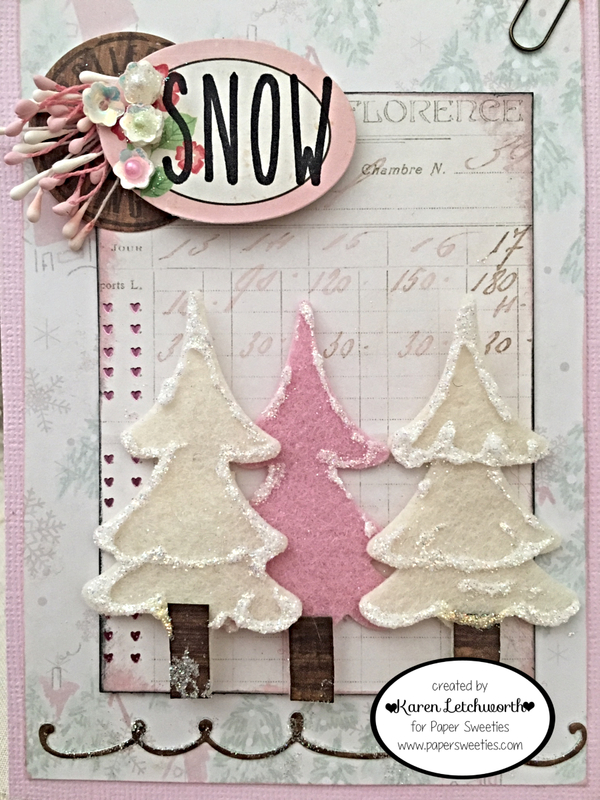 Much like I did yesterday, I'm sharing another card today for Paper Sweeties using some more of my favorite "Winter" stamp sets and products. 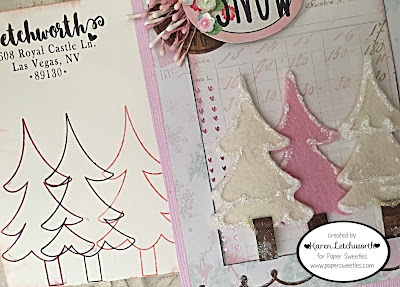 In fact, all my teammates at Paper Sweeties have created some Winter inspiration for you; and you can see it all on the Paper Sweeties Blog or by clicking on the highlighted links (names) at the bottom of this post. And of course, all the fabulous products you see featured can be purchased now at Paper Sweeties. For today's project, I used the new Merry Christmas Y'all Sweet Cuts to cut these gorgeous wool felt trees. I used the same Sweet Cuts to cut the trunks of the tree from a wood-grain patterned paper. I also added some Stickles and ultra-fine glitter to the trees to give them a light dusting of "snow". As you can see, these trees are GORGEOUS. I have already used this set countless number of times, and it was just released in December. This set is definitely an all-time favorite for me. Have you seen the adorable pick-up truck? Oh my yes, this Merry Christmas Y'all set is a must-have. The patterned papers I used are from Prima, and I inked everything pretty well. Did you know that Paper Sweeties carries several fabulous colors of Stamping Inks? They are just $3 each and just the perfect size to easily ink your stamps in the perfect color. There are SO many fabulous products in the Paper Sweeties Shop. For instance, the sentiment I used on this card (SNOW) is from the AWESOME new Merry Stamp Set. With eleven fabulous words, this will be another set that I will use for many years to come. I also used the Sweet Borders Sweet Cuts to add the wood-grain swirl border at the bottom of my card. I added several layered Sugar Sprinkles Sequins to my sentiment spot. 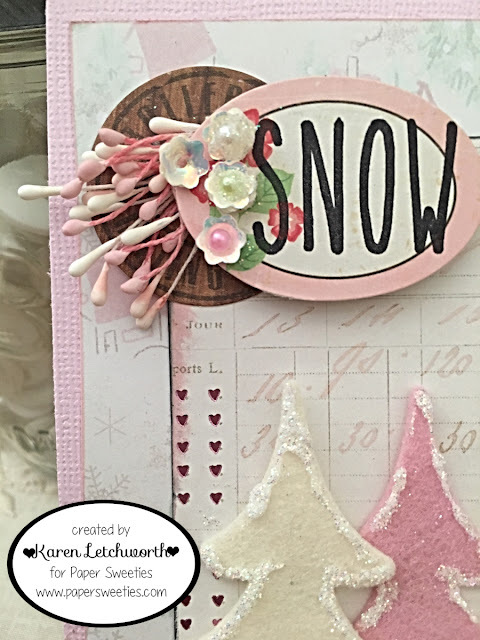 The other items I used on my card (items not carried at Paper Sweeties) include the various patterned papers/journalling card, cardstock, some stickers, and the double-head stamens in pinks and creams. Much like I did yesterday, I'm sharing a quick little matching envelope that I created for this card. It's so easy to grab your Paper Sweeties stamps and give your envelope a little love to make it as special as the card tucked inside. I used the awesome new Merry Christmas Y'all Stamp Set to stamp the trees on my envelope. I used Ballerina Pink and Mud Pie Ink to stamp the trees on the envelope. Here are the names of my talented teammates I mentioned earlier. If you click on their names, you will be taken directly to each of their sweet blogs so that you can peek at their Paper Sweeties inspirations for the month. Perhaps something you see will inspire your creativity. I do hope you'll take time to visit these talented gals, and that you'll treat yourself to some Paper Sweeties products. Oh my goodness...this is AWESOME! Such a pretty winter card and you really know how to make those Paper Sweeties product look great. Lovely, Karen! 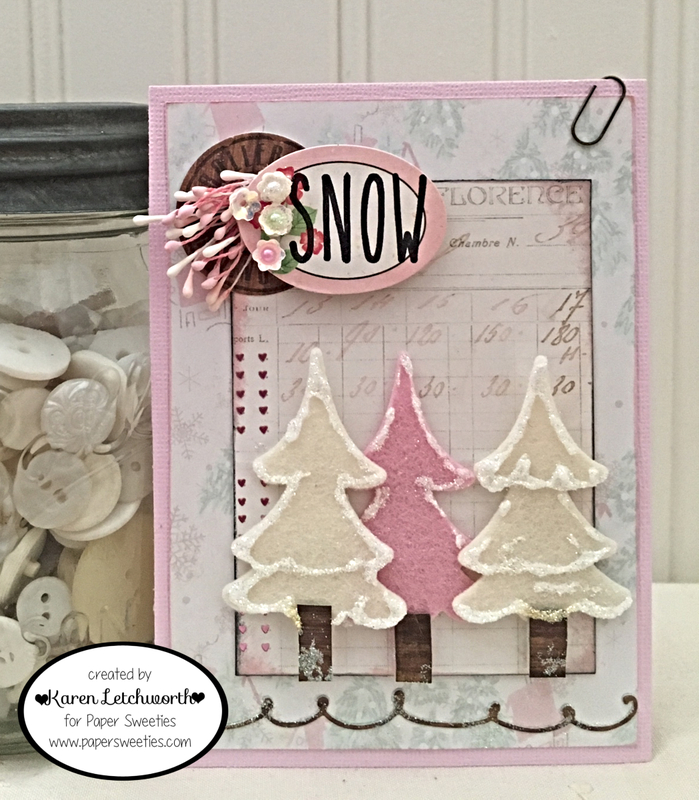 Love the pastel colors, and those trees look like sugar cookies, good enough to eat! Thank you for joining us at the Simon Says Stamp Wednesday challenge!